So, I translated Light first and Grass next; then It, then Alphabet. After that, several years went by (I had a baby and was raising him) before Butterfly Valley. Another gap in time (my son was a teenager), and I finally completed Letter in April. SN: On first reading Letter in April I was stopped in my tracks by its intimacy. It’s powerful, and at the same time there’s a great fragility within and beyond its intricate patterns and ingenious interchangeable sections. There’s this raw chronicle of a descent into an emotional and mental underworld, bound up with giving birth, with motherhood, and with relationship; and finally, a re-emergence/rebirth. I knew I had to be very careful, and caring, in translating it. By the time I finally focused on translating it, my son had been born and was almost grown, I had years more experience with relationship issues, including divorce, and was, I think, a bigger person than I had been. SB: I love where this conversation is taking us. To continue with the thread of the personal, what was it like working with the poet? SN: We would sit together at the worktable in her Copenhagen apartment, me with a cup of tea and the manuscript in progress, Inger with a cup of coffee and the original Danish book. Inger would read the first poem aloud in Danish, then I would read my translation aloud. Then we would lay the two poems side by side and look at them. We would go through each page that way. She would ask questions and offer comments, telling me what had been in her mind when she wrote certain lines. It was a huge gift, a tutorial with a world-class writer – one who thought of herself as just an ordinary person. Many of her questions were about shades of meaning in an English word or phrase I had chosen. She was interested in etymologies as well as current meanings (you can see this in her essays “It’s All Words” and “Silk, the Universe, Language, the Heart”) and I too love etymology. We both felt that people somehow sense the whole arc of human experience, beginning long before recorded history, within our oldest words. For instance, if you trace the etymology of the English word tree, you find that it originated with the speakers of the Proto-Indo-European language, who lived near the Caspian Sea in the Neolithic age and who gradually fanned out across India and Europe. Tree is derived from their word deru, meaning “firmness”. And you find that trust and truth come from that same root, deru. So, those two words are as ancient as our awareness of trees… I remember Inger saying that etymologies could almost be poems in themselves. Inger’s English was excellent, but she always spoke Danish to me. Hearing her Danish (she had a soft Jutland accent) was invaluable; it not only improved my fluency but also sensitized me to the varying tones of her writing voice. (There are recordings of her singing some of the poems from Light and Grass.) I was embarrassed by the many mistakes I made. But Inger was incredibly patient. I remember only one thing she ever said that bordered on criticism: “Her har du vist sjusket lidt.” (“Looks like you got a little careless here.”) As she said it, she patted my hand reassuringly. SB: Would you like to share a favorite anecdote? A different kind of memory: The day I received Butterfly Valley from Inger, a neighbor interrupted my reading, urging me to come outside and see something… It was a butterfly migration. Painted ladies – Vanessa cardui – called tidselfugle (thistle butterflies) in Danish. Inger includes painted ladies in the book. These butterflies were everywhere, covering bushes and flowers, landing on the sidewalks, our heads, our shoulders, our noses. It was so unusual that the newspaper even carried an article about it. In my nearly 50 years in San Diego, that’s the only butterfly migration I’ve ever seen here. SB: That’s so beautiful! Coming to the book of essays that has just been published, The Condition of Secrecy. What consistently fascinated me was the ease with which Christensen moves from her own thoughts to a whole range of texts. What an incredible range: from Leonardo da Vinci’s notes on Franceso Melzi and parallels observed in the writings of Jean-Francois Lyotard to scientific treatises, poetry by Lu Chi, Kierkegaard, to name a few. As her translator and close-reader, could you tell us how she had a comprehensive knowledge about so many subjects? SN: I think Inger was simply born brilliant. She had a gift for seeing patterns and systems and perceiving their implications, and she was endlessly interested and observant. Even in childhood, she was already thinking and experiencing the world in unique ways. That comes through clearly in her essays “Freedom, Equality, and Fraternity in the Summer Cottage” and “Interplay”. Her range of interests was vast: music (she had studied violin), art (she did fine freehand sketches, and striking modern art hung on her walls), hard and soft sciences (after secondary school she enrolled at the University of Copenhagen to study medicine), and natural history. On walks, she seemed to know the names and habits of every bird, tree, and plant in Denmark, and she was equally at home with more esoteric things. I remember her explaining details to me, one day, about the life cycle and the odd, Escher-like internal structures of certain rare freshwater sponges. I never heard her call any field of study “boring.” In fact, I never heard her say she was bored at all, in any situation. Of course, she also read world literature of all time periods and genres. She read in five modern languages besides Danish and was familiar with Latin and Old Norse as well. One early influence was Poul Borum (1934-1996), a fellow poet who would go on to become an internationally recognized literary critic and comparatist. They met in the 1950s. Reminiscing afterward, she recalled that on the day she showed him her poems, he immediately lit up and began to read all sorts of avant-garde poetry to her, poetry that she hadn’t yet encountered on her own. She experienced it as an epiphany, the discovery of “a sign system that already existed and that a person could walk right into and participate in”. They married, then later divorced, but their long friendship continued until his death. This strain of ecological and linguistic awareness is something that contemporary poetry is dwelling on today. Considering the socio-eocnomic and political contexts in which Christensen was writing, could you tell us something more about the literary history of Denmark at that point? SN: The quote is from her essay “The Seven Within the Die,” written in the 1990s. Danish literature in that decade was undergoing a sea change, bristling with innovations in form and content. One contributing factor was the 1987 establishment of the Forfatterskole (Creative Writing Institute), a two-year course run by leading authors and critics who encouraged experimentation and linguistic awareness. But Christensen was simultaneously a trend-setter and a writer unaffected by trends. As early as 1969, her immensely influential It had blown the lid off Danish poetry, if not all of Danish literature, exploding away from the modernism of the 1960’s and taking poetry in eye-opening experimental directions. For these and other reasons, modernism’s focus on imagery, introspection, and personal emotions no longer seemed adequate to a number of writers in the 1990’s. As formal innovation gained momentum, the electronic age accelerated the process: by the 1990’s, Danish literature encompassed performance poetry, hyper-fiction, mixed genres in a single work, mixed-media formats, and much more. In terms of content, a movement toward ecological awareness that began in Scandinavia in the 1970s never lost its foothold. Scandinavia began going green early and never looked back. So the sense of an interplay between the man-made and the natural has continuously been reflected, at least in the background of Danish literature, for decades. A Danish anthology from the 1980s, Natur menneske / Menneske natur (Nature and humans / Humans and nature) underscores that interplay. Examples from the 1990s might include Naja Marie Aidt’s earlier volumes as well as the later works of Per Højholt (1928-2004), and Morten Søndergaard’s 1998 Bier dør sovende (Bees Die in Their Sleep). SB: Right, I obviously cannot let this interview go by without asking you about It … which to my mind will keep blowing lids off any kind of fixed idea we may have of “literature”. In the first section of It, Christensen writes: “A world has come into the world”. When I read those lines, I was reminded what Ted Hughes wrote of Vasko Popa’s myth-building narrative poetry: “Popa’s imaginative journey resembles a Universe passing through a Universe”. How, just how, did you grapple with a text like It? SN: When I first read through It in Danish, I didn’t grasp the entirety of its universes or of Inger’s ingenious ways of creating them and letting them evolve. Complexities and inventive energy crackled from every page. Not until I had finished a preliminary draft translation, over a year later, did I start to get a fuller sense of what was going on. Over the course of that year I was very lucky to have Inger available and willing to answer my zillions of questions. Our onionskin airmail letters sailed back and forth regularly – this was the 1970s, so no email, no mobile phones, and overseas phone calls prohibitively expensive. After the first draft was done, I went to Copenhagen to work with her one-on-one, and gradually we wrestled the book into shape. Her former husband, the comparatist and critic Poul Borum, was also incredibly generous with help and suggestions during my visit. Even so, some of the poems in It didn’t become clear for me until much later. Then there was the visual aspect. It, in the original Danish, looks like it’s made out of blocks. The entire original book is set in Courier, the font that mimics typewriter script; the individual characters look squared off, and each one takes up exactly the same amount of space. This means that the first subsection is literally a square: 66 lines, each containing exactly 66 characters and spaces, all the letters perfectly aligned with those in the lines above and below. It’s within that square, that first block, that language and existence both begin, and then proceeds in variations until, in the final section, the ‘blockiness’ almost vanishes, except for the font; that final section wavers and softens like a long, tentative ribbon, ultimately dwindling into the single word that began the book. Inger had painstakingly engineered those effects. She composed parts of the book on graph paper, one character or space per square, then typed the entire manuscript on her typewriter. When the manuscript went to the printer, she insisted that the book be typeset to look exactly as her typewritten manuscript did. In the first section, I tried to replicate Inger’s 66-character lines, but ultimately had to give up and settle for keeping only the original line counts. SB: Thank you! This offers much insight into the craft of both composition and translation. SN: Years later, reading Inger’s essay “The Dream of a City”, I found these questions near the end: “What is it, actually, that we’re taking part in? What is a mass society? What is this city? A work of art, a mobile, a set of building blocks – or what?” She continues, “We dream, despite everything, of a more human way of expressing what we are now living.” Of course, I thought of It. It is all of those: a work of art, a mobile, a set of building blocks, and most of all, a more human way of expressing what we now are living. So, her 1964 essay contained the seeds of It, which wouldn’t be written until five years later. As Denise Newman, the masterful translator of Inger’s novels The Painted Room and Azorno, has said, Inger Christensen’s writings are all like that; they grow out of each other, each one carrying within it the germ of the next. SB: While reading ‘Silk, the Universe, Language, the Heart’, I kept thinking back to an essay by Gertrude Stein ‘Poetry and Grammar’, in which Stein dwells on each of the punctuation marks and slowly disentangles them from their traditional usage. Christensen, in her essay, writes: ‘All nouns are very lonely’ and ‘All prepositions are nearly invisible’. Did you have to bend the rules of grammar and composition while translating the prose works too? SN: Yes! Grammar, composition, and punctuation too. Inger originally wrote five of the Condition of Secrecy essays in German, then translated them into Danish afterward. The German reading public had known and respected her work since the publication of It in 1969, thanks in large part to her stellar German translator Hanns Grössel (1932-2012). So she was an honored guest in Germany, frequently invited to speak, and her talks later became some of the essays in The Condition of Secrecy. The thing about German is that its syntactic gymnastics are barely conceivable in English. It’s a little like Cæsar’s Latin or Proust’s French: a German sentence can easily take up a whole paragraph and go through numerous convoluted subordinate clauses before finally getting to the main verb. Danish is a bit more syntactically permissive than English, but even so, in translating her German essays into Danish Inger often pushed the envelope (and relished the adventure, I’m sure). For me, translating those essays was a challenge. Inger had created elegant, elaborate, looping sentences in German and then managed to bring them into Danish, and I didn’t want to destroy their effect by cutting them into neat little packets of English. (She once referred to English as “that strange, smooth language”.) But English-speaking readers aren’t used to following such complex paths, and I did want to make sure the sentences were comprehensible. I ended up using a lot of parallel structures and transitional repetition to keep readers oriented, with a liberal sprinkling of paired commas, paired dashes, and parentheses. And I decided it would be all right if readers had to back up and re-read some sentences. Inger didn’t mind making readers do double takes at key points in her essays. It provided windows for thought. SB: To be challenged by syntax: that’s my favourite kind of double-taking as a reader. Plus, I think, more than ever, now is the time for printed texts to encourage readers to engage critically with language. Is there something else that you’ve been translating and would like to tell us a bit about? SN: I’ve had several pleasures at once lately, all involving Danish poetry. One was translating Asta Olivia Nordenhof ’s fascinating debut poetry volume The Easiness and the Loneliness (Det nemme og det ensomme). It was published in June of this year by Open Letter Books. Another pleasure has involved polishing my translation of Naja Marie Aidt’s volume of poems, Everything Shimmers (Alting blinker). Finally, I’ve been working on some of the treasures from Inger Christensen’s recently published archives, a dazzling, 1,000-page compendium. Most recently I collaborated with American poet Denise Newman (translator of Inger’s novels Azorno and The Painted Room, and of Naja Marie Aidt’s short story collection Baboon) to translate two previously unpublished sonnets from Inger’s archives. 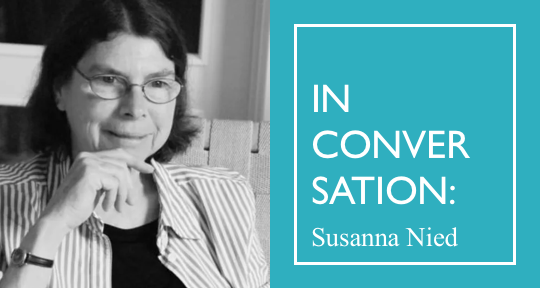 Translation is usually such a solitary enterprise – it was lovely to see those sonnets through Denise’s eyes as well as my own, to be in conversation with her as we crafted our translations, and to experience the ways our ideas sparked each other. journals and anthologies. Her award-winning translations of Inger Christensen’s poetry are published by New Directions. She lives in San Diego, California. I hope M. Nied will do a translation of Viggo Brondal at some point. After reading her in Poetry, I did a search for his books and could find nothing in English. He sounds fascinating.